Nearly everyone who lives in or owns property in the path of the Atlantic Coast Pipeline has an opinion. Generally a strong one. 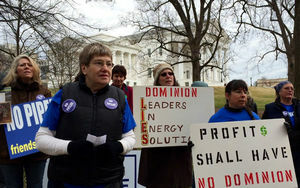 The proposed $5 billion, 550-mile natural gas pipeline that Dominion hopes to have in place by 2016 will clearly have an impact on the area if passed–whether that impact is a positive one or not, is the source of contention. The four major energy companies spearheading the project– Dominion, Duke Energy, Piedmont Natural Gas, and AGL Resources – have invested a lot of time and, well, energy trying to convince area residents that the pipeline will benefit the region. That the project will provide a reliable source of natural gas, curtail spikes in consumers’ energy costs, and provide jobs. Opponents in Virginia voice concern about the possible consequences of the 42” pipeline – environmental impact on water supplies, the native habitat of animal species, destruction of iconic scenery, and property values. Also at issue is whether the Karst topography of the land can safely support the structure. Recent natural gas explosions brought the issue to the attention of the national media. “Natural gas transmission is relatively safe but that is like saying that flying is safe until your plane goes down,” said U.S. Senate’s Commerce Committee chair Senator Jay Rockefeller, D-WV, following the 2012 explosion in his state. 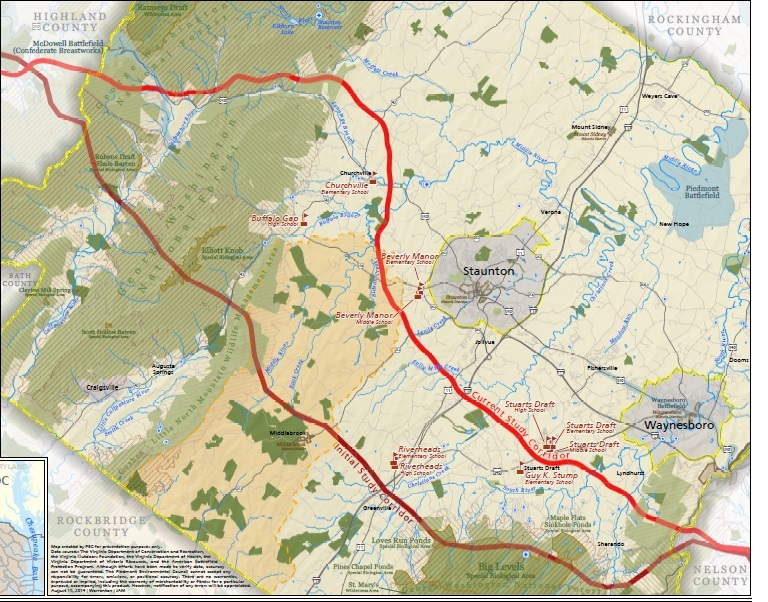 The latest proposed pipeline route would affect 40-50 miles national forests including 13 miles of the George Washington National Forest, as well as the Appalachian Trail, and the Blue Ridge Parkway. Letters dated February 23rd, the same day opponents protested and 10 were arrested in the state’s capital, informed 186 additional Nelson County property owners that surveying of their land will begin Monday March 2nd. Residents across the Valley are refusing to allow surveyors on their land and continue to organize to stop the pipeline. If you have received a letter and do not wish to allow surveyors on your property, there are lines set up to verbally deny permission. Neither side is backing down. Dominion is releasing information daily to try to allay the concerns of citizens and tout the effort as a boon to the economic development, state and local revenue, and domestic energy supplies. Whatever your thoughts and concerns, I urge you to stay abreast of developments and how they will impact you and your property. Become an advocate for yourself and the place you call home. Not saying this to be mean or anything, but any petitions against the pipeline by now are ineffective. True to the word, surveys have already begun. The pipeline has been sealed and approved by the Governor, Terry McAuliffe. But, I do share my concerns about the Karst situation with sinkholes even though contract geologists approved the pipeline to be built over those areas of concern. John, I really appreciate your comment but as long as it’s still a “proposed pipeline” and a proposed route, it’s not a “DONE DEAL” and property owners have every right to voice their opposition. If it came through my property, I’d be upset too. Imminent domain is ugly. It was my impression that it was already approved. Nope, still “proposed pipeline” and I too would be upset if it cut through my property. It doesn’t but it still concerns me that it is within a mile of my house and many homes in Nelson and Augusta counties are served by wells. The ground water is a huge concern. For all of us, not just those whose property is directly impacted.